Football Study Hall: Is Mike Gundy evolving the spread or abandoning it? Ian Boyd talks about the steps Mike Gundy is taking with his offense at Oklahoma State (LINK). Nick Baumgardner talks about Jim Harbaugh's slightly different approach to competition (LINK). Hit the jump for a few good looking women and a gif you can't stop watching. Thank you to David and Robert for your recent donations! If you would like to help with the TTB redesign effort, please donate using Paypal (on left sidebar) or by doing some shopping on Amazon (LINK). The goal is $3,000 and we're about a quarter of the way there so far. Cornerbacks coach Mike Zordich confirmed that Wayne Lyons will be joining the team this season, so I wrote up a commitment post (LINK). Concord (CA) De La Salle safety Je'Vari Anderson is still a possibility to join Michigan. He's a 6'1", 200 lb. prospect who's a 247 Composite 3-star, the #63 safety, and #902 overall. I talked about him a couple weeks ago as a guy who was talking about joining the Wolverines but needs a qualifying test score. He has listed offers from Cal, Oregon State, and Utah, but his Twitter account still says "THE MISSION IS GOO!! BLUE!!" with a giant picture of the Michigan banner (LINK). I mention him again this week because the deadline to sign a National Letter of Intent is Wednesday, April 1. He could still end up playing for Michigan without the NLI, but he would not be able to practice with the team until the first day of classes. For his sake - and for the team's, since I think he's a better prospect than his rankings/offers indicate - I hope he gets good results and can fax in his NLI before the deadline. It might also help with Michigan's recruitment of two of Anderson's 2016 teammates, tight end Devin Asiasi and center Boss Tagaloa. Tyrone (GA) Sandy Creek wide receiver Korey Banks, Jr. was offered by Michigan. He's a 6'0", 170 lb. prospect with offers from Arkansas State, Colorado State, and Western Michigan, among others. He visited this past weekend with a couple Lawrenceville (GA) Archer prospects for 2017, Isaiah Pryor and Jamyest Williams, who already held Michigan offers. Banks claims a 4.26 forty and is a track guy. Some teams are looking at him as a corner, but Jedd Fisch was the one to offer him, which implies that Michigan wants him at receiver. Hit the jump for several more 2016 prospects, some 2017 prospects, an offer for 2018, and some miscellaneous bits. Defensive coordinator D.J. Durkin is doing his best to transition to a man coverage defense (LINK). Hit the jump for Hannah Polites. Thanks to Josh for your recent donation! If you would like to donate to my website redesign drive, you can use Paypal (on the left sidebar) or you can do some shopping on Amazon (LINK). Thanks! Just for fun, I thought I would draft up teams for the spring game. I had the idea of finding someone else to draft against . . . and then time got away from me. Michigan's coaching staff is drafting teams this coming Saturday, a week ahead of the April 4th contest between squads. So here, a day ahead of time, are the players I and me would draft. Each team gets 25 players. Each side of the ball must be filled out completely for both squads. Players with known debilitating injuries or who are not on campus yet are not available for the draft. Specialists are not available, since special teams will not be played in the spring game. Rd. 1 for Magnus: Jourdan Lewis, CB. The hype on Jabrill Peppers is all just hypothetical for now, but Lewis had a breakout spring game last year and was Michigan's best defensive back during the 2014 season. Rd. 1 for Thunder: Willie Henry, DT. With the recent poor play of the offensive line, I want an interior defensive lineman to wreak havoc. Hit the jump for the other 24 rounds of the draft. Former Wolverine Ryan Van Bergen is opening a gym called Blue Lion Fitness in Ann Arbor (LINK). Hit the jump for some good looking ladies who have probably been to a gym once or twice. Poll results: Who is the best in-state player in Michigan? If you are so inclined, please help out with the TTB redesign drive by making a donation on Paypal (see left sidebar) or by doing some shopping at Amazon (LINK). Your assistance is greatly appreciated as I work toward moving away from Blogger. Thanks! A few weeks ago, I posted a poll asking: Who is the best in-state player in the 2016 class? I posted my own opinion shortly after National Signing Day (LINK). Luckily, it's Friday. Enjoy some beautiful women, including a gif of yoga pants! I can't help liking the responses from tight ends coach Jay Harbaugh (LINK). Hit the jump for several nice looking ladies. I had been holding off on this until something official came from the university, but rising fifth-year cornerback Wayne Lyons is transferring from Stanford to Michigan and will play for the Wolverines this fall. He will be immediately eligible as a graduate transfer. This had been rumored for a while, and cornerbacks coach Mike Zordich confirmed Lyons' pending arrival in an interview on Thursday. Cornerbacks coach Mike Zordich confirmed that Wayne Lyons will play for Michigan this fall (LINK). Hit the jump for a bunch of good looking women. Thanks to Scott, Brett, Daniel, James, and Andrew for your recent donations! If others would like to contribute to the TTB redesign drive, please find the Paypal button on the left sidebar or do some shopping on Amazon (LINK). Thank you! Blake O'Neill - P - Weber State: Quarterback Jake Rudock from Iowa visited last weekend, and now it's O'Neill's turn. O'Neill is a graduate transfer prospect who's a 6'2", 215 lb. punter. He averaged 44.1 yards/attempt last season and does not allow many returns. Sam Webb pronounced a "gut feeling" that O'Neill would end up at Michigan, so this visit may be just a formality. Cary Angeline - TE - Exton (PA) Downington East: Angeline is a 6'7", 230 lb. prospect with offers from Alabama, Auburn, Michigan, Notre Dame, and Penn State, among others. He's a 247 Composite 4-star, the #9 tight end, and #213 overall. As a junior in 2014, he had 67 catches for 1,051 yards and 10 touchdowns. Korey Banks - CB - Tyrone (GA) Sandy Creek: Banks is a 6'0", 170 lb. prospect with offers from Arkansas State, Colorado State, and Miami-OH, among others. He's an unranked prospect at this point. He claims a 4.26 forty, and while that is almost surely a fib, he does have good speed. Devin Bush, Jr. - LB - Hollywood (FL) Flanagan: Bush is a 6'0", 220 lb. prospect with offers from Alabama, Auburn, Florida State, Georgia, Michigan, and UCLA, among others. He's a 247 Composite 4-star, the #8 inside linebacker, and #249 overall. Bush is a Florida State legacy whose dad played safety for the Seminoles and is now Flanagan's head coach. Hit the jump for several more 2016 prospects, as well as some 2017 and 2018 kids. Video: Is Jim Harbaugh worth $5 million a year? Hit the jump for a few beautiful ladies if you feel so inclined. Thanks to Andrew, Rikard, Brian, and Richard for your recent donations! You guys are all awesome. If anyone wants to donate to the TTB redesign drive, you can use Paypal (on the left sidebar) or buy some stuff at Amazon (LINK). Coming out of Whitefish Bay (WI) Whitefish Bay, Hagerup was a Rivals 3-star, the #3 kicker, and the #10 player in the Badger State. He had offers from Arkansas, Florida, Ohio State, Tennessee, Wisconsin, and others before committing to the Wolverines in September of 2009. He then played in the 2010 U.S. Army All-American Bowl. Hagerup was a hit right off the bat when he started as the punter during his freshman year in 2010. In Rich Rodriguez's final year, punting was not an issue. Hagerup averaged 43.6 yards/punt, landed a third of those attempts inside the 20-yard line, launched a career-long 72-yarder against Purdue, and averaged 61.4 yards/kickoff on 19 attempts. That punting average was the third-best average in school history, behind only Monte Robbins (1987) and Zoltan Mesko (2009). Hagerup took a step backward as a sophomore, averaging just 36.0 yards/punt. Then he took a leap forward as a junior in 2012, ending the season with a 45.0 yards/punt average, booming 13 of them 50+ yards, and earning the Big Ten Punter of the Year award. Unfortunately, he was suspended for the entirety of the 2013 season (more on that later). He decided to return for a fifth year in 2014, when he averaged 42.9 yards/punt, landing 16 of them inside the 20-yard line. After several years of watching Zoltan Mesko boom punts, Michigan was looking for their next stud at the position when Hagerup was recruited. It was a big deal when he chose Michigan over several other big-time programs, including his home-state Badgers. For various reasons, Hagerup never became the fan favorite and weapon that Mesko had been. One big reason was his inexplicably (or perhaps explicably) subpar 2011 season. Another reason is that Hagerup fell just short of Sebastian Janikowski for his off-the-field exploits, getting in trouble numerous times with both coaching staffs for whom he played. He was suspended for a game in 2010 under Rodriguez, four games under Hoke in 2011, another game in 2012, and the entire 2013 season. The only season in which he could control his behavior was his fifth-year campaign after taking the Darryl Stonum Memorial Mutually Agreed Upon Get Your Life in Order Redshirt. Another reason is that, despite the solid-to-great punting averages, he was never really a "coffin corner" punter nor a guy who could consistently deaden the football at the 2-yard line. Too many of his punts either bounced into the endzone or were returned capably. In a game against OSU, no less. Hagerup had the 29th-best punting average in FBS this past season, and CBS Sports currently has him ranked as the #16 punter in the NFL Draft. Over the past three seasons, there have been 2, 2, and 1 punters selected. I do not believe he will get drafted, and I don't think that his talent warrants a potential character risk for a guy who was suspended for a total of 19 games throughout his college career. Since there are so few punting jobs available (and punters can play for such a long time), there's not a huge need for practice-squad guys or replacements. If one punter or kicker gets injured/released, teams usually just find a retread lingering around. So this is probably the end of the road for his football career. Here's a fluff article on a guy who could be our quarterback this coming season (LINK). Hit the jump for a few good looking ladies. Lingerie and boots are a good combination. Nick Baumgardner discusses new defensive coordinator D.J. Durkin (LINK). Hit the jump for a girl named Steph Pacca. Thanks to Robert for your donation yesterday! If you would like to contribute to the $3,000 goal for an overhaul of TTB, please use Paypal (on the left sidebar) or do some shopping on Amazon (LINK). Thanks! Montgomery (AL) Carver defensive end Marlon Davidson was offered by Michigan. Davidson is a 6'4", 260 lb. prospect with offers from Alabama, Auburn, Clemson, Florida State, and Georgia, among others. He's a 247 Composite 5-star, the #3 strongside end, and #27 overall. He claims a 4.9 forty. Davidson looks like a 3-4 defensive end or perhaps a defensive tackle at the next level. His technique is inconsistent, but he's a big boy who can run and shows some good aggression. His brother, Kenneth Carter, was a former defensive tackle at Auburn from 2010-2013, and Davidson is widely considered to be a shoo-in for the Tigers. Camden (NJ) Camden defensive end Ron Johnson, Jr. was offered by Michigan. He's a 6'4", 240 lb. prospect with offers from Alabama, Notre Dame, Ohio State, Penn State, and Rutgers, among others. He's a 247 Composite 4-star, the #17 weakside end, and #270 overall. He claims a 4.6 forty. Johnson is a kid who shows a really good motor and some good athleticism. A teammate of wide receiver Brad Hawkins, who already held a Michigan offer, the two visited Michigan this past weekend, but Johnson got news of the offer a couple days before making the trip. Wichita (KS) East defensive end Xavier Kelly decommitted from Kansas State. The 6'5", 230 lb. prospect committed to the Wildcats last November, but offers from Arkansas and Michigan in recent weeks have caused him to reopen his recruitment. He's a 247 Composite 4-star, the #20 weakside end, and #326 overall. 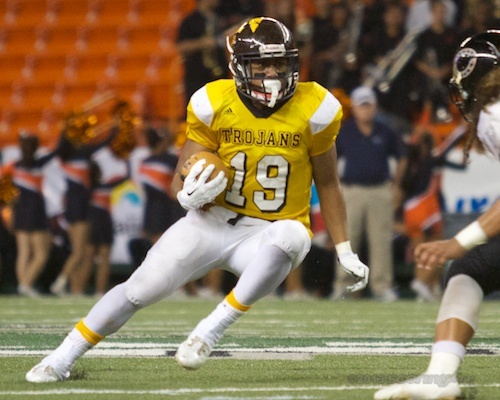 Mililani (HI) Mililani running back Vavae Malepeai was offered by Michigan. He's a 6'0", 195 lb. prospect with offers from Cal, Colorado, Hawaii, and Washington, among others. He's a 247 Composite 3-star, the #53 running back, and #731 overall. He claims a 4.44 forty. As a junior in 2014, he had 1,337 rushing yards, 205 receiving yards, and 24 total touchdowns. Hawaii doesn't have the best competition in the country, so highlights should be taken with a grain of salt. However, Malepeai does have some impressive vision, an innate ability to slither out of tackles, and decent speed. He does a really good job of following his blockers, staying right on their hip for the added protection. He is the cousin of Michigan offeree Boss Tagaloa and is coached by former NFL special teamer Maa Tanuvasa. Michigan has only had two players from Hawaii in the history of the program (in 1925 and 1945), and the program only makes rare forays into the state for offers. The last time they went after an Aloha State player was in 2013 for defensive tackle Scott Pagano (Clemson). Montgomery (AL) Carver linebacker Lyndell Wilson was offered by Michigan. Wilson is a 6'2", 220 lb. prospect with offers from Alabama, Auburn, Clemson, Florida, Florida State, LSU, and Ohio State, among others. He's a 247 Composite 5-star, the #2 outside linebacker, and #8 overall. He claims a 4.64 forty. As a junior in 2014, he made 86 tackles, 9 sacks, 5 forced fumbles, and 2 interceptions (1 returned for a touchdown). Do yourself a favor and watch his highlights, because he has one of the most impressive highlight reels I've seen in the 2016 recruiting class. You'll even see a couple highlights against incoming freshman Keith Washington and 2016 running back offeree Kingston Davis. Unfortunately for Michigan, it looks like an Alabama vs. Auburn battle for Wilson. Cuyahoga Falls (OH) Walsh Jesuit center Jack Wohlabaugh was offered by Michigan. Wohlabaugh is a 6'3", 280 lb. prospect with offers from Cincinnati, Kentucky, Minnesota, and Purdue, among others. He's a 247 Composite 4-star, the #15 offensive guard, and #334 overall. He is also the son of Dave Wohlabaugh, who played center for Syracuse before moving on to the NFL to play for the Patriots, Browns, and Rams. Jack plays left guard for his high school team, and he shows quick feet with a good initial punch. However, with his size, pedigree, and quickness, he probably projects to center at the next level. Hit the jump for lots of miscellaneous bits. Devin Gardner is sure that he'll get a chance to play in the NFL (LINK). Me, I'm not so sure. I mean, I'm pretty confident that someone will give him a shot as an undrafted free agent, but I doubt he's going to get drafted. So he might have a very short amount of time to prove himself before he gets tossed on the scrap heap. I hope he makes it, though. Hit the jump for a few good lookin' ladies. America Again: Re-Becoming the Greatness We Never Weren't by Stephen Colbert. Written in the same style as I am America (And You Can Too!) as well as some Jon Stewart and Co.-written books in the past, Colbert's most recent book is another quite humorous attempt at making us look like idiots. I find that I can only really stand to read about half of each one of these books at a time before the writing style becomes a little too much for me to bear. They're well worth the read if you're looking for some entertainment to go along with your politics, but the sarcasm and double-speak are better digested in chunks. David and Goliath by Malcolm Gladwell. I have now exhausted the list of Malcolm Gladwell books, and I am kind of sad because of it. This one was his weakest effort, in my opinion, because the whole premise is based on underdogs taking down the kings of the hill. (Luckily, there was no mention of Appalachian State.) I did find Gladwell's story about David and Goliath interesting, because Biblical history has always piqued my curiosity. (Spoiler alert if you haven't read it: Goliath may have had a hormonal condition that caused him to be very large, but also somewhat dumb with poor vision.) However, I also got somewhat bored with his discussion of the Catholics and Protestants in Ireland, because basically, the whole damn thing is stupid. Basically, the message of the book is that sometimes advantages can be disadvantages, and disadvantages can be advantages. I did make some connections to football, because part of being a coach is motivating kids and convincing them they have a chance to succeed when the guys across from them might be bigger and/or faster. Fire in the Hole by Elmore Leonard. For no good reason at all, this was my first foray into the writing of Elmore Leonard. One would think that being from Michigan, I would have bothered to pick up one of his novels or short story collections earlier in my life. Heck, I never even bothered to watch any of the movies based on his books, but I have been watching Justified for several years. I finally decided to pick one up, and why not start with the group of short stories that involves Raylan Givens? The Givens story "Fire in the Hole" was predictably good, and there are some other solid efforts in there, too. I had not realized that Leonard would be so preoccupied with United States Marshals in general, but they're mentioned consistently throughout his stories. One thing I like about Leonard is that he does not mess around too much with descriptors and flowery speech. I went ahead and picked up Pronto, which I'll be starting soon. Dexter's Final Cut by Jeff Lindsay. Speaking of being sad, I finally finished the Dexter series of books. If you have not read the books and/or watched the entire series, you may want to stop reading here. This final Dexter effort has him working as a technical advisor for a cop show filming in Miami. He overextends himself to not only being a blood spatter analyst and serial killer, but also the bodyguard of a beautiful Hollywood actress. I don't want to give away the exact ending of the book for anyone who might glance too far down in this paragraph, but I will say that the book and the television series do not end on high notes. Dexter, Breaking Bad, and some other shows feature morally ambiguous protagonists, and I always hoped that Dexter and Walter White would somehow redeem themselves. People often ask me if the series end the way I want them to, but that's not really the point. If stories end how we want them, then there would be no point in anticipating a surprise ending. I actually found this book to be the most compelling Dexter novel of the series, but mostly because my feelings toward him had shifted from ambiguity to rooting against him. What about you? Any reading suggestions for us? Funchess was dealing with a toe thing this past season (LINK). Poll results: Who will start at quarterback in 2015? Shane Morris wasn't smiling very often during the 2014 season. Thanks to Jerry, Jonathan, and Keith for your very generous donations to the TTB redesign drive! If anyone else would like to chip in to the $3,000 goal, you can use Paypal (LINK, or on the left sidebar) or go shopping at Amazon (LINK). Thanks! Last week I posed the question: Who will start at quarterback in 2015? I'll start off by saying that I don't really care who the starter is. What matters most to me is that the starter is good, or at least the best man for the job. The junior Morris is the most experienced guy currently on Michigan's roster, although a transfer in from Jake Rudock (below) would change that immediately. Unfortunately, Morris has a 0-to-5 touchdown-to-interception ratio and completed just 35% of his passes last year. The highly touted recruited has a cannon for an arm and some decent wheels, but his decision-making has left a lot to be desired. Speight has earned some momentum in spring practices, according to some observers. He's a big guy who can move a little bit. Despite being a redshirt freshman, he will turn 21 in December of this year after taking an extra year of high school due to a broken collarbone. Malzone has earned some praise this spring from some observers, and the occasional report says he's the leading candidate for the job right now. However, I have not heard as many positive reports on him as the former two. Malzone is reportedly struggling with mechanics, arm strength, and the speed of the game right now. Rudock, who is visiting Michigan this weekend, has not been offered by the Wolverines yet. And in order to come to Michigan, he would need to jump through some hoops with the Big Ten, since he's a fifth year transfer candidate from the University of Iowa. I imagine that 16% number here has more to do with whether he'll actually choose/be allowed to play for Michigan, since his starting experience, 61.7% completions, and 16-to-5 interception ratio last year would almost certainly vault him to the top of this list. Gentry is a true freshman who will not arrive on campus until this summer. While he might have the highest ceiling of everyone on this list (he's 6'7", has a strong arm, and a good runner), he will also be the newest to the college game. It's Friday night, so start your weekend off by taking a look at some beautiful women, including a fun gif. Here's a bit of a fluff piece on Greg Mattison and the new staff (LINK). Beyond the jump is a girl with a nice bum, a girl with a pretty face, and then a girl who looks good, period. Thanks to Daniel and Robert for your generous donations! If you want to help me redesign the site, please consider donating on Paypal (LINK, or on the left sidebar) or shopping on Amazon (LINK). Thanks! Based on recent developments and leaks, I'll toss out some of the recent rumblings from practice, which you can feel free to dissect/discuss. Quarterback: Different sources will say different things. I don't really have much to add to that, except it seems like Shane Morris is mentioned most often as looking the best. Running back: Ty Isaac had questions about his toughness coming out of high school, but he has played through some things this spring; however, he has been suffering from hand and hamstring injuries, so he is limited. Derrick Green has also been injured, and Drake Johnson is coming off that ACL tear. The one constant has been De'Veon Smith, who has been earning praise for his vision and attitude. It's not really a secret that Smith can have a sullen disposition at times. Fullback: With Sione Houma out due to injury, it's still Joe Kerridge, Brady Pallante, and Chase Winovich getting reps at this spot. Hit the jump for the rest of the positions. Johnathan Berghorst - DE - Zeeland (MI) East: Berghorst, a 2017 prospect, is a 6'3", 245 lb. end with no offers at this time. He has visited Michigan numerous times, and while it's rare that guys hang around Michigan a ton and don't eventually get some kind of chance, nothing really stands out about Berghorst on film. He does still have two years of high school ball left to play, though. Jalen Cochran - DE - Canton (MI) Canton: Cochran is a 6'4", 225 lb. prospect with offers from Iowa and a few MAC schools. He's a 247 Sports 3-star. Cochran is largely under the radar so far, but I believe he's perhaps a pretty big sleeper and could earn some big-time offers by the time everything wraps up. Donnie Corley - WR - Detroit (MI) King: Corley is a 6'2", 180 lb. prospect with offers from LSU, Michigan, Michigan State, Notre Dame, Ohio State, and Ole miss, among others. He's a 247 Composite 4-star, the #20 wide receiver, and #109 overall. Michigan was outside of his released top five because he had not built much of a relationship with the new coaching staff, but Harbaugh's crew is working their way back up the ladder. Corley is visiting Tuesday, March 17. Brad Hawkins - WR - Camden (MI) Camden: Hawkins is a 6'2", 205 lb. prospect with offers from Florida, Michigan, Notre Dame, Pitt, Rutgers, and South Carolina, among others. He's a 247 Composite 4-star, the #33 wide receiver, and #161 overall. Currently he appears to be favoring the Gamecocks, but he does not look to be in a hurry to make a decision, so Michigan still has a chance to work their way to the top. Safeties coach Greg Jackson keeps the Jabrill Peppers Hype Train rolling (LINK). Hit the jump for some good looking ladies, especially the second one. Thanks to Kevin for your recent donation! If anyone else would like to donate to my plan for a site redesign, you can use Paypal here (LINK) or on the left sidebar. You may also do some shopping at Amazon to help out (LINK). 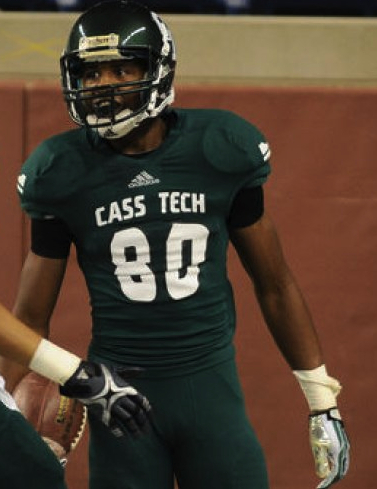 Coming out of Detroit (MI) Cass Tech, Hollowell followed the likes of Boubacar Cissoko and Teric Jones, both of whom were diminutive Technician cornerbacks who would eventually play at Michigan, albeit with shortened careers. Hollowell was a Rivals 3-star and the #25 cornerback in his class, choosing Michigan over Central Michigan in January 2010, approximately a year before National Signing Day. Hollowell mostly played as a special teamer in 2011, making 6 tackles and 1 fumble recovery, the latter of which came in the Sugar Bowl against Virginia Tech. He played a little more in both phases of the game as a sophomore in 2012, totaling 4 tackles and 1 more fumble recovery against Purdue. Then as a junior in 2013, he made 2 tackles and 1 fumble recovery. I hypothesized that he would have a 2014 season that included 0 tackles and 1 fumble recovery, but he broke the trend by making 15 tackles, 2 tackles for loss, and 2 pass breakups. Those numbers came in significantly increased snaps on the defensive side of the ball, as injuries and ineffectiveness opened the door for him to play more. Hollowell was a small corner coming out of high school, and I questioned his abilities at the time. When he started his career at Michigan, I was surprised that he played as a true freshman. I thought he would be the type of kid who would certainly redshirt, but that turned out not to be the case. Brady Hoke burned his redshirt and got a fumble recovery out of him. Hollowell would eventually turn into a pretty solid gunner and special teams coverage guy, but he never panned out on defense. Aside from the three career fumble recoveries, his play on defense this past season was very frustrating. When Raymon Taylor and Jabrill Peppers were injured, and when Blake Countess was benched for stretches because of poor play, Hollowell got more time on the field than anyone probably wanted. The results were not positive, as several teams picked on him as soon as they saw him enter the game.
. . . being the first recruit to earn me some hate mail. If you look back at my commitment post from January 2010 (LINK), you'll see that I gave him a TTB Rating of 58 and questioned whether he would make an impact at Michigan. You'll also see if you scroll down to the comments that various family members, Cass Tech people, etc. were not happy with my characterization. I received a couple e-mails objecting to my statements, too. That was really the first time that a bunch of people came out of the woodwork to descend on my site with anger. Five years later, I still remember that as a landmark in my blogging "career," although not necessarily a positive one. Hollowell was the star of Michigan's pro day last week (LINK), running a hand-timed 4.34, showing off a 37" vertical, and doing other things that pro scouts generally like. Unfortunately, his play on the field probably won't warrant a look at the next level. He was never a starter (well, he started one game as a senior), mostly played special teams, and never made an interception. Michigan has had better corners who never did anything in the NFL (Donovan Warren, J.T. Floyd, Todd Howard, etc. ), so I think Hollowell will probably follow in their footsteps. Iowa quarterback Jake Rudock is getting closer and closer to being a Michigan Wolverine, although it's not a done deal yet (LINK). Hit the jump for some pictures of Kimberley Garner, plus a video on the Sports Illustrated swimsuit issue from Last Week Tonight with John Oliver. Thanks to David, Kevin, William, and Sean for your donations to the TTB redesign campaign. You can donate at Paypal (LINK) or shop at Amazon (LINK) if you would like to contribute. When Jim Harbaugh was negotiating for the job at Michigan, he required permission to expand the football staff. Obviously, athletic director Jim Hackett agreed, which has resulted in a hiring binge. These hires have been well publicized in the last several weeks, and I want to take a look at a few of them. Erik "Soup" Campbell, unidentified administration job: I have talked about Erik Campbell several times on this blog, and devout Michigan fans are probably already familiar with the name. Campbell was a safety and wide receiver at Michigan in the 1980's, became a GA for the Wolverines in 1988, and then coached the wide receivers for the Wolverines from 1995-2007 under Lloyd Carr. His acolytes include Braylon Edwards, David Terrell, Marquise Walker, Mario Manningham, Tai Streets, Jason Avant, and Steve Breaston, among others. When Rich Rodriguez was hired, he somewhat inexplicably fired Campbell, who went to Iowa and coached Marvin McNutt, Derrell Johnson-Koulianos, and tight end Tony Moeaki. He has spent the past two seasons with the Montreal Alouettes. It's unclear what Campbell's job description will be at Michigan, but it's a possibility that he will replace Jedd Fisch at some point. Fisch was hired on a one-year contract and generally changes jobs every couple seasons. Campbell's return to coaching the wide receivers would be welcome. Hit the jump for discussion of three more staff hires. Jordan Glasgow, the younger brother of Michigan linemen Graham and Ryan, has committed as a preferred walk-on for next year (LINK). Hit the jump for a few pictures of Kate Upton. Site News: Help me redesign the website! 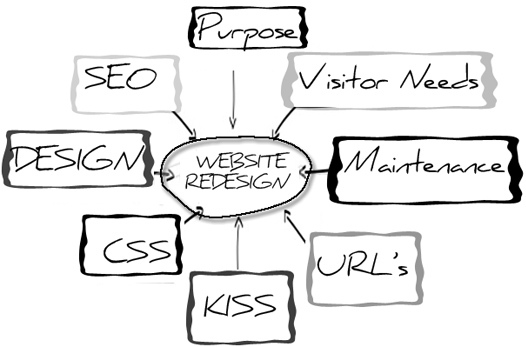 As I mentioned over the weekend, I have started the ball rolling on redesigning the website. I have explored a few avenues, met with a web developer, and chosen a path. Based on the developer's references, I am confident that the new site will be something of which I can be proud and we can all enjoy. With that goal in mind, I have placed a Paypal button on the left sidebar in case you would like to contribute to my push for the redesigned website. My goal is to raise $3,000, which covers most (but not all) of the proposed funds required for everything I aim to include. I know this goal might seem ambitious, but I want to grow the website for us all to have a better experience. Some aspects of Blogger have begun or continue to frustrate me. I want to assure you that I will be pocketing $0 of any donations up to the above number, because every single penny - and more - of that would go toward the redesign. Anything and everything would help, and your contributions are greatly appreciated. You can track the progress of the goal with the thermometer on the right sidebar, which I plan to update on a daily basis (or whenever donations come in). As always, thanks for reading and for discussing Michigan football with me. Go Blue! Concord (CA) De La Salle safety Je'Vari Anderson has been rumored to be working toward attending Michigan. Anderson is a 6'1", 200 lb. prospect who reported offers from Cal, Oregon State, and Utah. He's a 247 Composite 3-star, the #63 safety, and #902 overall. Anderson has reportedly been held back by the lack of an SAT score (or at least a qualifying SAT score) and needs that to qualify. However, the deadline for signing a National Letter of Intent - which he did not do in early February like most football prospects - is rapidly approaching on April 1, 2015. From my understanding, he can still qualify and join a football program in the fall even if he doesn't sign by that date, but he will not be able to participate in football practices or receive a scholarship until the first day of classes. Whereas most freshmen arrive in June, start classwork over the summer, and start practicing in early August, he would virtually be forced into redshirting because he could not practice until the first day of the fall semester, which is September 8th. By that time Michigan will have played the game against Utah. Anyway, Anderson is a pretty impressive athlete who has some skills as both a running back, safety, and special teams player. If Michigan is indeed trying to get him to join the program, I think they will be getting a potential starter, not just a late wish-and-prayer gamble, although the academic side could be a concern in the long run. Additionally, Anderson is a teammate of a couple 2016 Michigan offerees in center Boss Tagaloa and tight end Devin Asiasi. If Anderson ends up wearing a winged helmet, that could help with those two players, whom Michigan is pursuing hard. Washington (DC) St. John's tight end Devante Brooks was offered by Michigan. He's a 6'5", 230 lb. prospect who committed to Tennessee in January; he also has offers from Iowa, Maryland, North Carolina, and West Virginia, among others. He's a 247 Composite 4-star, the #10 tight end, and #225 overall. Brooks is pretty solid to the Volunteers but may consider taking some visits. Houston (TX) Westside defensive tackle Jordan Elliott was offered by Michigan. He's a 6'4", 305 lb. prospect who committed to Baylor in January and holds offers from Alabama, Florida State, Oklahoma, and Texas, among others. He's a 247 Composite 4-star, the #13 defensive tackle, and #137 overall. As a junior in 2014, he made 78 tackles, 31 tackles for loss, 12 sacks, 2 forced fumbles, and 2 fumble recoveries. He's impressively light on his feet and quick enough to play some defensive end for his high school team. Elliott is very talented and not the type of player one would traditionally associate with Baylor, but this is more proof that the Golden Bears are moving up in the world. Elberton (GA) Elbert cornerback Mecole Hardman was offered by Michigan. He's a 5'11", 170 lb. prospect with offers from Auburn, Clemson, Florida, Georgia, Notre Dame, and Tennessee, among others. He's a 247 Composite 4-star, the #8 cornerback, and #101 overall. Hardman plays quarterback for his high school team and some colleges want him to be a receiver, but Michigan is looking at him as a corner. He is very likely to stay in SEC country and has Georgia and Tennessee as his top two schools, so getting him up north will be very difficult. 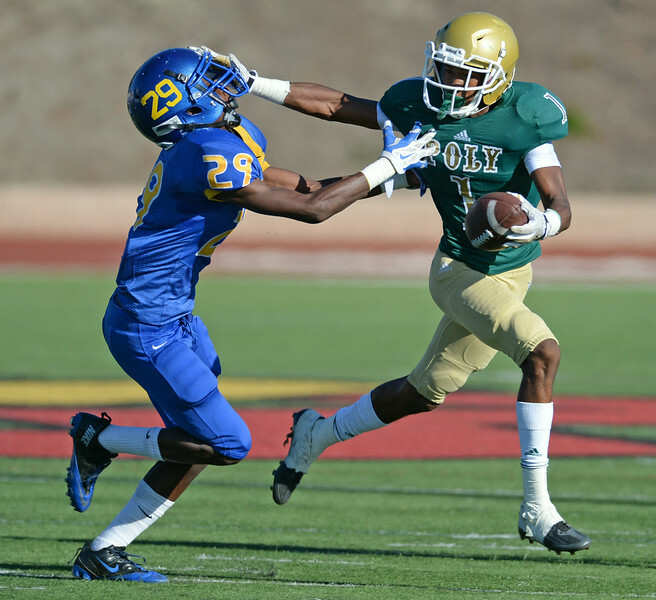 Long Beach (CA) Poly wide receiver Jack Jones was offered by Michigan. He's a 5'11", 170 lb. prospect with offers from Notre Dame, Oklahoma, and UCLA, among others. He's a 247 Composite 4-star, the #4 athlete, and #77 overall. Jones could play receiver or corner in college, and with a highlight video titled "The Greatest," anything's possible, right? On the same day Michigan offered, he put out a top three that included the three aforementioned schools, so Michigan is playing from behind right now. He attends the alma mater of former Michigan cornerback Donovan Warren. Hit the jump for another 2016 offer, some 2017 prospects, a guy who committed elsewhere, and some random bits. Unfortunately, the basketball team's season ended prematurely with a 16-16 record that did not get them selected for the NIT (LINK). Hit the jump for a model named Svetlana Bilyalova. MLive: Harbaugh hopes to have have game, draft for "spring game"
Jim Harbaugh is hoping to make Michigan's spring game an actual game (LINK). Hit the jump for some pictures of Paige Hathaway. John Harbaugh came to Ann Arbor for Michigan's coaches clinic and had some interesting things to say (LINK). Hit the jump for some pictures of blond bombshell Sydney Maler. You know, I have started to run out of pictures of the attractive Michigan fans, but I'm not opposed to posting them when I find them or receive them. So if you have any pictures of girls wearing Michigan gear, drop me an e-mail. In the meantime, hit the jump for a slightly racy AMGOTW. Coming out of Toledo (OH) St. John's, Miller was a Rivals 3-star and an unranked weakside defensive end. Yep. That's how stupid the recruiting sites can be sometimes; they call future centers "weakside ends." Anyway, Miller chose the Wolverines over offers from Illinois, Michigan State, Pitt, Stanford, West Virginia, and several others. He was one of the last players to commit to Rich Rodriguez (on December 10, 2010) before the coach was fired. Here's my commitment post from ye olden days (LINK). Miller necessarily redshirted as a freshman in 2011 because he was very undersized at 263 lbs. He played sparingly as a backup in 2012. He got a chance to start in 2013, but he was quickly replaced after four games by then-redshirt sophomore guard Graham Glasgow, who had his own share of struggles. Not only was Miller getting pushed around, but he was also completely whiffing on assignments too often. By the beginning of the 2014 season, the redshirt junior had started to figure things out and earned the starting center nod for the Darrell Funk-coached offensive line, holding the job for the entire year. For his accomplishments, he was named the best offensive lineman on the team. The incumbent was expected to hold his position in 2015, but he decided after a few practices in spring ball to hang up his cleats. As you can tell if you look back at that commitment post, I was never a huge fan of Miller's abilities. He played a little high, was undersized, and wasn't a great athlete. However, it should at least be considered that he was a guy recruited by Rich Rodriguez to play in mostly a zone system, and then he had to play in a more pro-style offense under Brady Hoke. When Miller actually played, he was somewhere between 288-296 lbs., which isn't tiny but isn't huge, either. He was downright bad in 2013, but he was serviceable in 2014. In a year when three other guys held their jobs for the whole year, Miller was named the top lineman and cut down on the mistakes he made as a redshirt sophomore. Some fans held an indelible grudge against Miller for what happened in 2013, but he probably would have been the starter again in 2015 for what should be a solid offensive line. Now it looks like the center job will go to fifth year senior Graham Glasgow, who played guard last year, or redshirt sophomore Patrick Kugler.
. . . his friendly jowls. At no point in his career did he seem like a manly beast of an offensive lineman, but instead looked like an oversized 14-year-old. 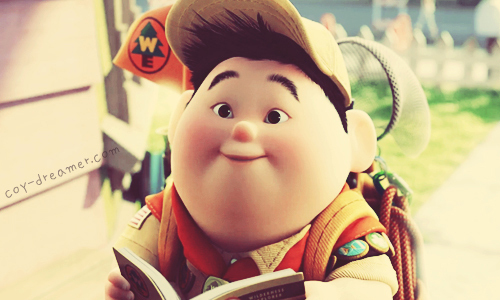 Maybe like the real-life version of Russell from Up. Miller says that he's furthering his education and pursuing business interests, so it does not look like he'll be working toward playing professional football of any sort. In any case, he was probably not bound for the NFL and might have been more of an Arena League-caliber guy. Would-be fifth-year center Jack Miller has decided to forgo another season on the football team (LINK). Hit the jump for some pictures of Chrissy Teigen, including a gif of her in a yellow swimsuit. Logan Byrd - QB - Kathleen (GA) Veterans: Byrd is a 6'3", 229 lb. prospect with offers from Duke, Minnesota, North Carolina, and Pitt, among others; he recently decommitted from Virginia Tech, where former Michigan player/coach Scot Loeffler was recruiting him. He's a 247 Composite 3-star, the #20 pro-style quarterback, and #432 overall. Byrd is somewhat of a dual-threat guy, although he does not possess great speed or elusiveness. Considering the other guys Michigan has offered, he would probably be a second-tier target, but driving up from Georgia could net him an offer once he gets to campus. Jordan Fuller - S - Westwood (NJ) Old Tappan: Fuller is a 6'2", 190 lb. prospect with offers from Alabama, Clemson, Florida State, Michigan, Notre Dame, Ohio State, and UCLA, among others. He's a 247 Composite 4-star, the #9 athlete, and #141 overall. His older brother, Devin, is a wide receiver for UCLA and was recruited by Michigan a couple years ago. Jordan is one of Michigan's top targets at the safety position. Khalid Kareem - DE - Farmington Hills (MI) Harrison: Kareem is a 6'4", 252 lb. prospect with offers from Alabama, Michigan, Notre Dame, and almost all the rest of the Big Ten, among others. He's a 247 Composite 4-star, the #14 strongside end, and #227 overall. Kareem briefly committed to Michigan State last month, but it was short-lived and he has since opened up his recruitment. Hit the jump for several more prospects. Hit the jump for Tyrone Wheatley's question-and-answer session. Even without this news, Jake Rudock to Michigan has been talked about for days, if not weeks. Today's news, however, is the first solid information to come out about the flirtation between the two parties (LINK). Hit the jump for some pictures of model Brittany Oldehoff. You want Wilton Speight to be Michigan's starter, don't you? In case you've been under a rock for the past several months, you realize by now that Michigan is in a pretty undesirable position when it comes to the quarterback . . . position. The Wolverines lost a 2.5-year starter in the form of Devin Gardner, who is pursuing a career as an NFL wide receiver. Meanwhile, one experienced backup has struggled greatly, the other experienced backup transferred to the University of Texas at San Antonio, and the other guys available are freshmen of differing sorts. Nobody really knows how this will shake out, but here are some thoughts and rumors. It's hard to believe that someone with those statistics could be the front-runner for any job, but Morris is the aforementioned experienced backup. He backed up Gardner in 2013 as a freshman when Russell Bellomy had a torn ACL. He did not fare well, but there were glimpses against a pretty good Kansas State defense in the Buffalo Wild Wings Bowl. Then 2014 came along, and there were no more glimpses. Morris threw an ugly late-game interception in a blowout win over Appalachian State, and he also threw picks against Utah and Minnesota; meanwhile, despite some decent running skills, Morris has yet to account for any kind of touchdown during his college career. That's 87 career passing attempts and 15 carries without a score. This spring he has reportedly been splitting snaps pretty evenly with the other scholarship quarterbacks available, but nobody has separated himself. Morris has a strong arm, decent accuracy, and those running skills, but his decision-making has generally been terrible. Hit the jump for the rest of Michigan's options under center. A guy named Zoltan(!) takes a look at NFL free agent defensive end Brandon Graham, a former Wolverine (LINK). UPDATE: After I set this to post, it looks like Graham will be re-signing with the Eagles on a four-year contract. Hit the jump for three good looking women. One note before we get started is that Jim Harbaugh is littering the country with offers in the 2016 cycle. It's unclear if/when the offers will slow down, but so far there are over 160 offers out for this cycle. By comparison, even after he tried to salvage the 2015 class, the Wolverines only offered 149 prospects. In fact, the last time Michigan offered this many prospects was during the 2012 cycle (LINK), when Brady Hoke offered 193 players. It would be surprising if Harbaugh did not obliterate that mark, considering the fact that we're still about 11 months away from National Signing Day. One reason may be that Michigan is recruiting loads of players from California, Florida, and Texas. As we saw in the Rich Rodriguez days, that strategy can sometimes pay off but without the geographical connections, the hit rate is going to be much, much lower. Mineola (TX) Mineola center Austin Anderson was offered by Michigan. He's a 6'4", 285 lb. prospect with offers from Illinois, Kansas State, and TCU, among others. He's a 247 Composite 3-star, the #67 offensive tackle, and #820 overall. Anderson is a punishing blocker with a good motor who does not have great length or athleticism, so despite being ranked as an offensive tackle, he is probably going to become an interior lineman at the next level. His father played for Southern Mississippi. Mineola (TX) Mineola offensive guard Riley Anderson was offered by Michigan. He's a 6'5", 285 lb. prospect with offers from Arizona State, Illinois, Kansas State, and TCU, among others. He's a 247 Composite 3-star, the #69 offensive tackle, and #849 overall. You may have guessed by now that Austin and Riley are twins, and their rankings are pretty darn close, too. However, Riley has a little more length than Austin, and if he can't stay on the edge, Riley might be able to play guard. Lawrence (KS) Lawrence defensive end Amani "Moose" Bledsoe was offered by Michigan. He's a 6'5", 270 lb. prospect with offers from Florida State, Kansas, Kansas State, Notre Dame, Ohio State, and Oklahoma, among others. He's a 247 Composite 4-star, the #15 strongside end, and #226 overall. Bledsoe plays pretty high and looks pretty awkward when making tackles, so he looks raw but obviously has some size and athleticism. Hit the jump for numerous other 2016 offers, a commitment elsewhere, and some random tidbits. MLive: Michigan dubbed search for Jim Harbaugh "Project Unicorn"
In case you didn't listen to the Jim Hackett interview I linked to the other night, here's an article on what Hackett said on the Huge Show (LINK). Hit the jump for some pictures of one Demi Rose Mawby. Good ol' TTB is up to 18,000,000 pageviews, and there are over 4,000 posted articles here on this blog. It's hard to believe we've typed up that many articles and had that many viewers. Thanks, everyone! As a reward, you can hit the jump for pictures of over 25 beautiful women, plus a video of Emily Ratajkowski and Sara Jean Underwood duking it out in a fast food commercial. Michigan athletic director was on the Huge Show and talked about the hiring process that brought Jim Harbaugh back to Ann Arbor (LINK). You will not regret hitting the jump for some pictures of Daniela Tamayo. I posted a ranking of in-state prospects for 2016 a couple weeks ago (LINK), and here's Clint Brewster's list from Wolverine 247 (LINK). Hit the jump for three very good looking ladies. In the throes of spring practice, bits and pieces are leaking out. Here are some things to note that you may or may not have heard already. The quarterbacks are a mixed bag. Various reports have suggested various things. Some people will tell you that Shane Morris looks the best. However, there's more chatter about Wilton Speight and Alex Malzone. The buzz on Malzone is that he's picking things up very quickly, which is impressive for a freshman early enrollee. Jabrill Peppers is good and loud. Peppers is playing safety, and he has been raved about with regard to his athleticism and leadership. There will probably be growing pains, but Michigan hasn't had a great athlete at safety in a while. Furthermore, senior linebacker Joe Bolden says that Peppers screams the defensive calls louder than necessary. The kid is high-energy and loves the game of football. Michigan has the potential for their best safety combination in a long time with senior Jarrod Wilson and Peppers back there. Chase Winovich is working at fullback/tight end. The redshirt freshman, who is listed at 6'3" and 230 lbs., has reportedly been playing some fullback and tight end this spring after being recruited as a linebacker. You may remember that he was a very effective running quarterback in high school, in addition to his defensive exploits. With the Wolverines failing to reel in Chris Clark (UCLA) in the 2015 class, the tight end position is a little thin. And with senior fullback Sione Houma missing spring practice due to injury, the team is limited there, too. Add in the fact that both of Michigan's experienced fullbacks - Houma and Joe Kerridge - are seniors, and maybe Winovich's move to offense will become permanent. He has supposedly been wearing #44, which is a change from his defensive number of #58. The catch here is that it thins the linebacking corps, which has four players with senior eligibility in 2015 (Desmond Morgan, James Ross III, Joe Bolden, Royce Jenkins-Stone) and needs bodies in the coming years. If Winovich sticks on offense, that might take away a key option for the 2016 season. Brady Pallante is also a fullback. This was addressed last week. He's a 6'0", 276 lb. fullback wearing #45. Everybody is a fullback. Except Terry Richardson. The guys are bigger. Pretty much across the board, players have added weight. In particular, defensive tackle Willie Henry is up to 311 lbs. and Bryan Mone is up to 325 lbs. Those are not typically the numbers you look for in a penetrating, 3-tech defensive tackle. I would look for those two guys to be playing some nose tackle. Furthermore, there are some other size improvements with offensive tackle Logan Tuley-Tillman up to 309 lbs. and guard Graham Glasgow reaching 303 lbs. Tuley-Tillman was over 330 lbs. in high school, trimmed down to 285 at one point, and is now back up over the 300 lb. threshold. Linebackers Mike McCray II (242 lbs. ), Ben Gedeon (241 lbs. ), and Royce Jenkins-Stone (240 lbs.) are all larger than the typical Michigan linebacker over the last few years. Practice tempo has increased. The practice tactic that's en vogue these days is to maximize reps. Reports have said that Michigan has two lineups going in practice, and a play is being run every 25-35 seconds. Rather than making corrections on the field, corrections are made in film. This has been made easier in recent years with film able to be disseminated over the internet through Hudl and the like. It's especially big for spread teams who like to run hurry-up, anyway. It's not surprising that Harbaugh is adopting spread strategies even though he won't run a typical spread offense; he seems to be the type of coach who is always looking for an edge. Running back is still a question mark. While I believe the running game will improve this season, a number of factors go into that - coaching, experience on the offensive line, experience at running back, and the addition of Ty Isaac. However, Isaac has reportedly been limited due to a cast on his hand, and none of the running backs are sticking out right now. Of course, early practices are always dominated by the defense, so this doesn't necessarily mean much. Personally, I believe Isaac will come out on top at some point. Wide receivers have promise. Most of the buzz has been about redshirt freshman Maurice Ways, Jr., whose body is ready for playing at this level. One question mark about Ways has always been his hands, so that will be something to watch. Regardless, he might have the best combination of receiving qualities at this point - size, leaping ability, speed, etc. As I've mentioned before, he has some of those same traits that we saw in some of the greats of yesteryear (Marquis Walker, David Terrell, Braylon Edwards). That's not to say Ways will add his name to that list, but he at least has a chance, in my opinion. Fellow redshirt freshman Drake Harris has also been impressive at times. Harris has missed most of the past two seasons due to injuries, and he's listed at just 174 lbs. People express concern about his size, but I am not worried about that facet of his game. If he's as good as his high school hype when it comes to speed and leaping ability, playing under weight won't hamper him from having an effect on the team. Wide receiver size is overrated. It might be the one spot on the field where you find successful guys ranging from 5'8" to 6'5", and you have skinny guys (Roy Roundtree, Tavon Austin, DeSean Jackson) doing well just like big guys (Calvin Johnson, Anquan Boldin, Devin Funchess). If Harris is 6'4", 174 lbs., and can ball, the most important part of that is the third part. There are some other prospects who will potentially be visiting Ann Arbor this weekend, but Mack is the only one that I know of who has set a solid unofficial visit. I will add more to the list if/when I get the word. Austin Mack - WR - Fort Wayne (IN) Bishop Luers: Mack is a 6'2", 205 lb. prospect with offers from Michigan, Notre Dame, and Ohio State, among others. He's a 247 Composite 4-star, the #26 wide receiver, and #122 overall. As a junior in 2014, he caught 69 passes for 1,062 yards and 15 touchdowns. Mack was high on the Wolverines when they first offered, but the Fighting Irish and the Buckeyes seem to have jumped ahead since. He seemed to fall off Michigan's radar for a bit when the 2014 season started going south, but Jim Harbaugh's hiring may be able to re-ignite that original spark. MLive: Michigan QB job "wide open"
Nobody knows who the quarterback will be this fall (LINK). Cream of the 2015 Crop: Hyattsville (MD) DeMatha safety Tyler Green (#532 overall in the 247 Composite) is a one-time Ohio State Buckeye commit who decommitted in December. He ended up signing with the Hoosiers, and with Michigan struggling at safety, I had hoped that the Wolverines might throw their hat in the ring. Green is big at 6'3", 195 lbs. and might end up as a linebacker. Indiana also signed JUCO wide receiver Camion Patrick, the #53 junior college prospect, out of East Mississippi Community College. 2016 Team Ranking: N/A. The Hoosiers have yet to receive a commitment in the 2016 class. Cream of the 2016 Crop: N/A. The infamous Jim Tressel talks about Michigan's new coach (LINK). Hit the jump for Alyssa Miller, another girl, some other girl, and then, finally, some girl in a gif. Taylor attended Highland Park High School in Detroit and was a Rivals 4-star, the #14 athlete in the 2011 class. Here's my commitment post for him from January 2011 (LINK), when the one-time Indiana commit flipped to Michigan after the Wolverines hired Brady Hoke. I gave him a TTB Rating of 67. When Taylor arrived in 2011, Michigan was in a tenuous situation at the cornerback positions. Injuries, attrition, and some downright poor play had thinned the ranks of viable cornerbacks. Four different players (J.T. Floyd, Troy Woolfolk, Blake Countess, and Courtney Avery) started games that season, and Taylor played as a backup in three of those games, making 2 total tackles. In the 2012 season opener, Countess tore his ACL, and Taylor stepped in to start for the remainder of the year. He tallied an interception in consecutive weeks against Notre Dame and then Purdue, returning the latter for a 63-yard touchdown; he also made 45 tackles, 1 fumble recovery, and 1 pass breakup that year. As a junior in 2013, Taylor remained a starter and had his best career performance, notching 86 tackles (1st on the team), 1.5 tackles for loss, .5 sacks, 4 interceptions, 1 fumble recovery, and 9 pass breakups. Based on his junior year, expectations were fairly high for him as a senior; his career ended with a disappointing 38 tackles, 1 tackle for loss, and 6 pass breakups as he suffered some nagging injuries and started just eight games. 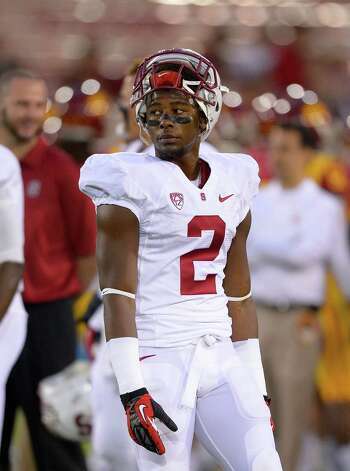 In the long term, Taylor will probably be a rather forgettable, solid cornerback. He was a three-year starter who did not get taken advantage of consistently, but he was not consistently good, either. Playing at about 5'10" and a little over 180 lbs., he did not show great speed but was physical enough and athletic enough to hang with the guys he was guarding. His two most memorable plays were probably those two picks as a sophomore when he jumped a pass against the Fighting Irish and then sort of lucked into that touchdown against the Boilermakers. Michigan fans thought they might have found a hidden gem at that point, and that feeling continued through his junior season. The somewhat inexplicable drop-off as a senior coincided with a drop-off by the whole team; otherwise, Taylor himself might have been under more scrutiny.
. . . that touchdown against Purdue. It was a little bit of luck that the ball dropped into his hands, but it's a beautiful thing when a defender scores a touchdown of any kind. Especially when it comes at the expense of Danny Hope and Caleb TerBush. Taylor was not invited to the NFL Combine. He will likely participate in Michigan's pro day, which typically happens in mid-March. I'm inclined to believe that some of Taylor's struggles as a senior can be attributed to his health, and his solid play from 2012-2013 might warrant a second look by some NFL teams. However, he will have an uphill battle to latch on with an NFL squad. He does not have good size, and his speed is pretty average for a corner. He probably will not get drafted, he might get signed as a rookie free agent, and then he might bounce around some practice squads before finding a short career in the CFL or AFL. Livonia (LA) Livonia defensive end Willie Baker was offered by Michigan. He's a 6'4", 225 lb. prospect with offers from Arizona State, Arkansas, Ole Miss, and Tennessee, among others. He's a 247 Composite 3-star, the #33 weakside end, and #523 overall. As a junior in 2014, he made 112 tackles, 30 tackles for loss, 12 sacks, and 6 forced fumbles. I do not see Baker as a weakside end at all, and in fact, he looks like a 3-4 defensive end, a strongside end, or even a defensive tackle after he adds weight. He is somewhat stiff and does not use his hands well, but he is very physical and likes to hit. Kentwood (LA) Kentwood cornerback Shyheim Carter, an Alabama commit, was offered by Michigan. He's a 6'0", 185 lb. prospect who also holds offers from Clemson, Georgia, LSU, and Mississippi State, among others. He's a 247 Composite 5-star, the #3 cornerback, and #33 overall. He claims a 4.38 forty. Chances are slim that Michigan will be able to flip Carter out of the deep south, so this is more likely a case of the coaches trying to build relationships in the area. Elk Grove (CA) Franklin cornerback Lamar Jackson was offered by Michigan. He's a 6'3", 205 lb. prospect with offers from Boise State, Colorado, and UCLA. He's a 247 Composite 4-star, the #32 cornerback, and #328 overall. He claims a 4.46 forty. Jackson is a jack-of-all-trades type of player for his high school, where he also plays some quarterback. At his size he is probably most likely to play safety, wide receiver, or maybe even linebacker eventually. Charlotte (NC) Victory Christian tight end Thaddeus Moss was offered by Michigan. Moss is a 6'4", 240 lb. prospect with offers from Boston College, Duke, Marshall, and Wake Forest, among others. He's a 247 Composite 3-star, the #24 tight end, and #686 overall. He is also the son of former all-world wide receiver Randy Moss, who grew up in West Virginia, attended Marshall, and went on to play for the Minnesota Vikings and New England Patriots, among other teams. The younger Moss is not the physical freak that his dad was, but he seems to have a high football IQ and makes some excellent plays in his own right. Thaddeus is a bit of a lumbering tight end, but he knows how to release from the line and can make some acrobatic catches. He also flashes some talent as a defensive end, where he makes some nice hustle plays, picks off a couple passes, etc. I don't see a huge talent difference between him and Tyrone Wheatley, Jr. - who was ranked higher - except for the fact that Wheatley is a couple inches taller and 20-30 lbs. heavier. Hit the jump for a few more 2016 offers, some 2017 offers, a commit elsewhere, and a few miscellaneous bits.